Are you loving avocado week? I am LOVING avocado week. Perfect in season right now, I have been adding them to just about everything. Sandwiches with chunky avocado, guacamole spooned onto bean tacos, salads of fresh summer produce and avocado slices. It’s been an incredible few days. When I suggest avocados to my clients, many reject the option, thinking they are too high in calories or fat.Yup, it’s true that they are a high-fat food, but the type of fat in the avocado is so healthy for you! Phytosterols account for a large portion of the fat content, helping to reduce inflammation in our tissues. Avocados also contain a high amount of oleic acid, similar to olives and olive oils. Oleic acid is helpful for absorbing fat soluble nutrients (like those found in fruits & vegetables) and has been shown to help lower the risk of heart disease. All this for a few hundred calories, 30g fat and 10g fiber per avocado. Filling & more nutritious than other more traditional fat sources, like oils. Today I’m featuring a favorite new recipe, avocado wontons. Think spicy, creamy filling in crispy wonton skins, dipped in spicy sauce. Similar to a crab ragoon; creamy avocado replacing the cream cheese with vegetables in place of the crab. I originally started off baking them, but halfway through decided to fry 1/2 the batch. And, let’s be honest- I liked the fried better. Baked wontons are great, but they don’t have the same flaky, crispy exterior of lightly frying them. If you do end of frying them, make sure your temperature is at the right heat (350-375°F) to absorb the least amount of oil possible. After removing them from the fryer, place on a paper-towel or paper grocery bag to absorb any excess. Avocado Wontons! Like crab napoleons, but vegan and healthy! Wonton skins stuffed with avocado, corn and veggies. Lightly fried and served with a dipping sauce. Add the corn, onion, garlic, roasted bell pepper, tomatoes, scallions with lime juice in a medium bowl. Toss to combine. Gently fold in the diced avocado, being careful not to overmix. Place 1-2 tsp. onto each wonton wrapper. Gently fold over to close. Dip fingers in water and gently press along wrapper edge to seal. Continue to make all wontons. Heat 1 cup oil to 375. If you don’t have a thermometer, the oil is ready when a 1″ cube of bread dropped into the oil browns in 60 seconds. Place the wontons, 2-3 at a time, in the oil and fry for 1-2 minutes until golden brown. Remove and place on paper towel to absorb the excess oil. Enjoy and serve with dipping sauce. These are SCREAMING my name 🙂 Yum Alex. They look so good. Seriously… love the photos too! 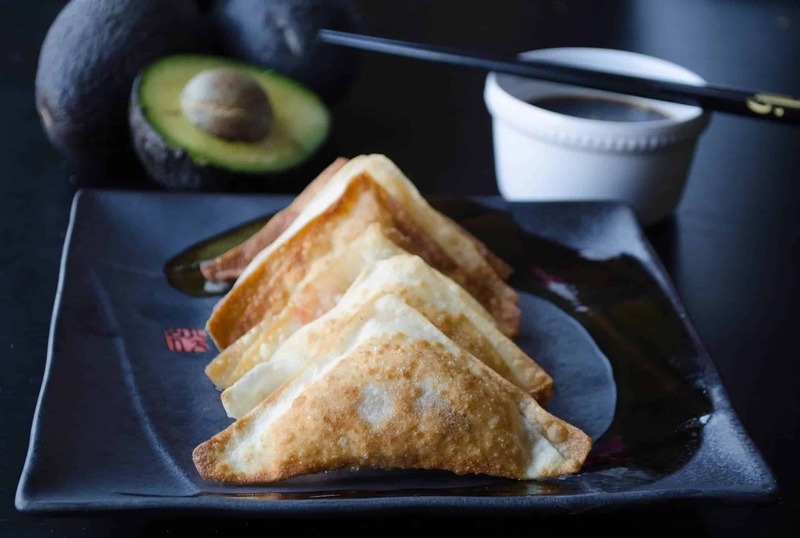 I looove avocado’s and your pictures make these wanton look so good I can almost taste them already. I’m definitely going to give these a try. Bookmarking this recipe right now! One of my favorite sushi places makes something similar to these – they’re more of egg rolls, but they are so good. I’d love to be able to get my fix by making them at home – probably much healthier too. Thanks Dana! Hope you like them, they remind me of the avocado eggrolls at our local brewery. You could roll them that way as well! These sound so yummy. As I read this I was wondering if you have ever tried spraying with oil and then baking? Probably turn out mushy, huh? Hi Heidi, I’ve done that with other foods, but not with these wontons. The baked version didn’t come out as crispy as I’d like, which is why I fried them 1/2 way through! Let me know if you try it with these and how it works out! I love fried won tons! This is such a great idea, using avocados. Delicious!